Oliver finds out that Adrian Chase is Prometheus. He is told by Talia Al Ghul because she has been training Adrian and giving him information on Oliver. She also tells him what her last name is and why she is helping Adrian. Talia tells him she wants to see him pay for killing her father that is why she is working with Adrian. Felicity visits the Helix headquarters. Oliver and Diggle search for Susan. Oliver and Diggle go to Chase’s house looking for her and Oliver is confronted by police once again because Adrian called them. He gets away again. 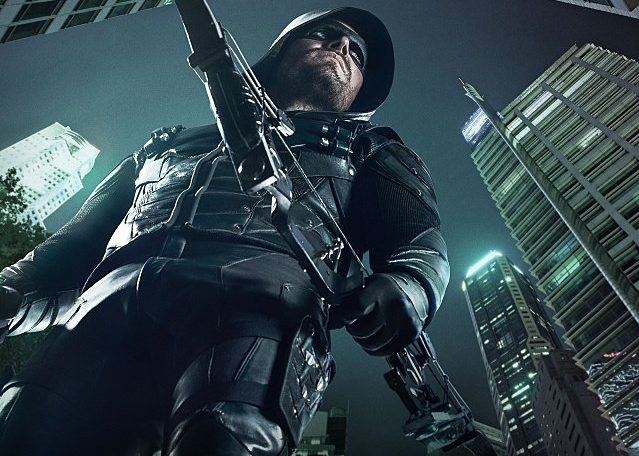 Oliver holds a press conference and basically says that if Arrow does not turn himself in a certain amount of time he will give the order to shoot Arrow on sight. Oliver confronts Chase about Susan. He tells him that if he dies so does she because Oliver will not find her in time. Oliver tells the team about Adrian being Prometheus. One of them suggests telling Pike. It is shot down immediately because they have no proof yet. Felicity gets the proof they need through Helix. Oliver turns the information over to Pike. After receiving the visit from Oliver and gaining the information Pike is stabbed and now in a coma. Felicity gets in deeper with Helix. They want her to help hack a government drone before they will help her again. She receives information on a video after she agrees to help. The deeper she gets in with Helix the more I see trouble for her. She is hiding the fact she is working with them from Oliver and the others. She disappears and does not answer her phone when they need her. Like Oliver told her though she does not work for him that she is doing what she does for the team because she wants to help. They are able to free Susan and get her to a safe place. Prometheus and Talia set a trap for Oliver and capture him. Next week’s episode Prometheus goes to extreme lengths to destroy Oliver.